Cassie Kiener (‘19) plants to throw the frisbee at a tournament this year. Freya captains Hanna Doerr (‘19), Cassie Kiener (‘19), and Gracie Velasco (‘21) lead a team that appreciates individuality, sets competitive goals, and has fun along the way. 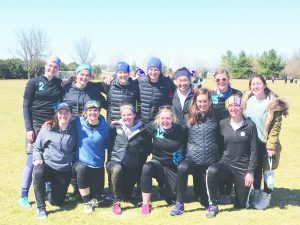 Freya, Luther’s only women’s ultimate frisbee team, considers themselves an intermediate mix of the two other ultimate teams, Luther Ultimate Flying Disc Association and Pound. Freya is serious about the sport, but they do not take themselves too seriously. In some ways, however, Freya is unique. 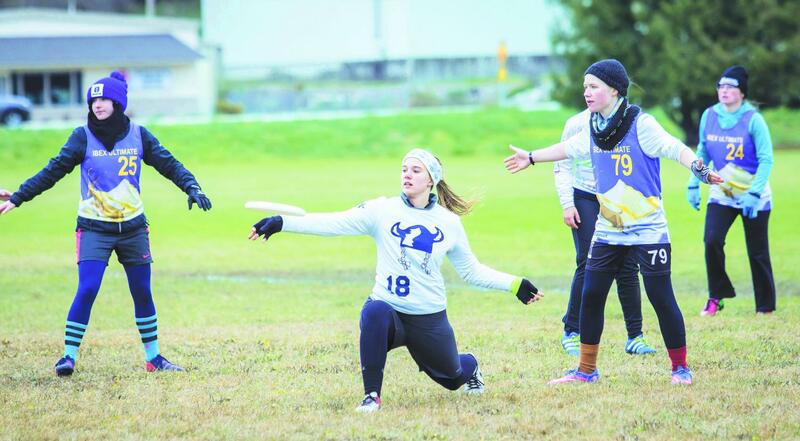 According to Team Manager Rachel Koller (‘20), having a women’s ultimate frisbee team at Luther open to anyone identifying as a woman is important to creating a community that cares about personal issues on deep levels. At the beginning of each season, the captains share an article with the team that addresses how women apologize for making a mistake too often. Instead of saying, “I’m sorry” after a mistake, Freya encourages its team members to say, “I’m a star.” In doing this, Kiener said it helps the team realize that a mistake was made, but the next time will be better. This phrase encourages teammates to build each other up instead of tear one another down. Without an official coach, the three captains gather weekly to plan the practices. At these practices, which are typically on Monday through Thursday nights with occasional Saturday lifting sessions, captains take turns calling out drills or explaining plays and terms to the other players. They also receive help from their unofficial coach Hannah Garry, (‘16) who was on Freya during her time at Luther, and now lives in Decorah. Freya team members at the Old Capitol Open tournament this spring. During the fall season, the practices are spent teaching and learning the fundamentals. Women with no ultimate frisbee experience can walk onto the team, and they will be taught everything they need to know about the sport. J-term is for conditioning, and spring is for competitions. USA Ultimate requires teams to play at least 10 games before the end of the season to qualify for USA Ultimate College Championships, which is in Bryan College Station, Texas this year. At each tournament, Freya will play six or seven games. Over spring break, Freya competed in tournaments in Statesboro, Georgia and Cedar Rapids, Iowa. They ended the week with a 7-6 record. They played six games, going 3-3 at the College Southerns tournament in Statesboro. In Cedar Rapids, the team went 4-3 at the Old Capitol Open tournament. Lots of playing time in these tournaments jumpstarted Freya’s goals to improve during the remainder of the season. These goals include strengthening their playing techniques, winning more games, and qualifying for the national tournament. According to player Ella Sneltjes (‘22), these improvements will come from refining their skill sets. “[We want to] continue to have better field awareness and learn the tendencies [of our] teammates so that we can work off of each other better,” Sneltjes said. Freya continues to generate inter-team dialogue about women in sports during team bonding activities, like watching movies or baking banana bread. Team members also encourage one another to attend Luther Platform events, Decorah women’s marches, and to wear their “The future is female” tee shirts. Freya members encourage one another as women and teammates, and more importantly, as friends.